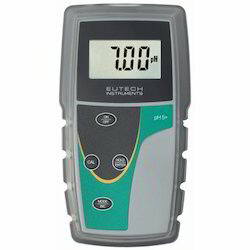 Providing you the best range of lutron dissolved oxygen meter, dissolved oxygen bench meter, eutech eco ec high tester, eutech instruments, crucible lids basins and eco tds high eutech meter with effective & timely delivery. 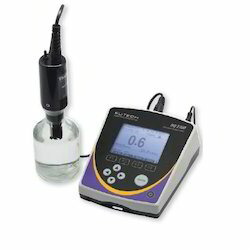 Dimension 180 x 40 x 40 mm, 7.1" x 1.6" x 1.6"
This Digital Dissolved Oxygen Meter is supplied with a polarographic type probe with an incorporated Temp. sensor which serves for precise Dissolved Oxygen ( DO ) and Temp. measurement. Applications for Aquarium, Medical research, Agriculture, Fishhatcheries, Laboratory,Water conditioning, Mining industry, Schools & Colleges, Quality control. Heavy duty dissolved oxygen probe, probe head size can connect with BOD bottle, All in one Pen type Dissolved Oxygen Meter, easy operation. Automatic Temp. compensation from 0 to 50 for sensor. Microprocessor circuit assures high accuracy and provides special functions and features. Multi-display, show Dissolved oxygen and temperature at the same time. Build in temperature , °C, °F measurement. Temperature unit can default to °C or °F LCD with two display, easy readout. Auto power off to save the battery life IP-67 Water resistance. Records Maximum and Minimum readings with recall. Data hold function for freezing the desired value. Use the durable, long-lasting components, including a heavy duty & compact ABS-plastic housing case. Dimension:180 x 40 x 40 mm (7.1" x 1.6" x 1.6" ). Accessories: Soft carrying case ( CA-05A ) -1 PC. Included Operation manual -1 PC. Spare Probe head with Diaphragm OXHD-04 - 2 PCS. 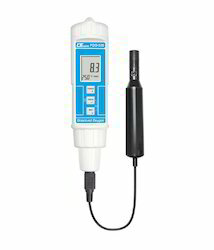 HI Dissolved Oxygen Meter for Laboratories Features: Extended range up to 300%. Extended altitude compensation to 4000m, Extended salinity compensation to 40 g/L .Automatic calibration in air PC compatible Data logging and storage of up to 8000 samples. Accuracy (@20°C/68°F): (%Saturation O2) ±1.5%F.S. Logging Interval: 1, 15, 30 seconds or 1, 2, 5, 15, 30, 60, 120, 180 minutes. Dimensions/Weight: 240 x 182 x 74 mm / 1.1 kg Product Contents: HI 2400 is supplied with dissolved oxygen probe, (2) HI 76407A membrane caps, HI 7041S electrolyte solution (30 ML), power adapter and instructions. Our organization is involved in manufacturing and supplying of Eutech Instruments. These appliances are designed in our modern manufacturing facility to ensure optimum performance. Digital testers are used for checking the flow of electricity in AC/DC cables or presence of dissolved oxygen in water or for many other purposes. Our testing instruments are widely used in various fields like Gas Power Plants, Oil Refineries, Paper Industries etc. 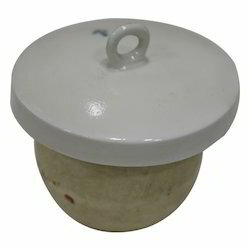 We are engaged in supplying of a wide range of Crucible - Lids - Basins - Quartz Ware. Manufactured using superior quality basic material, these are known for features like reliable performance, durable finish standards and optimum functionality. Also, our procurements agents ensure that these are in liner with defined industry standards at the time of sourcing. 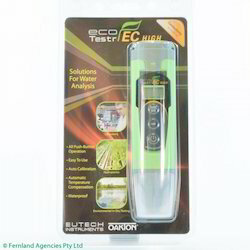 Looking for Eutech Instruments ?